The forecast sea breeze arrived a little later at Hampton - around 4pm. I just bought a new wetsuit from SHQ - an NPX 3/2 for not-so-cold conditions. It is a kitesurfing suit with "drains" at the bottom of the legs to stop water bags forming above your ankles when water jets up the legs under speed. 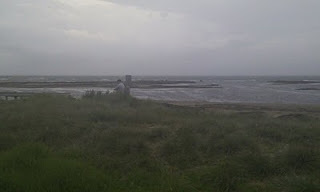 The wind was not strong, but I decided to try out the new wetsuit and the Noise 12m in the lighter winds. It was a nice session. 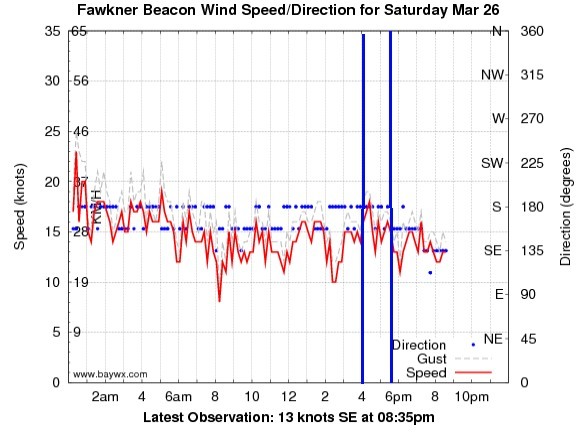 I flew the kite to create apparent wind and was going well and keeping upwind a little. Its strange how the run out against the waves is a much slower than the tack back it. It just doesn't feel like the same wind! The new wetsuit performed well. It was warm but not too hot. The water drains in the legs worked in a fashion, but the bottom of the legs still got "folded in" by water pressure jetting up them. The water could work its way out though. The wetsuit came with veclo straps and has webbing loops for them at the end of the legs. I will try out the velcro straps next time. 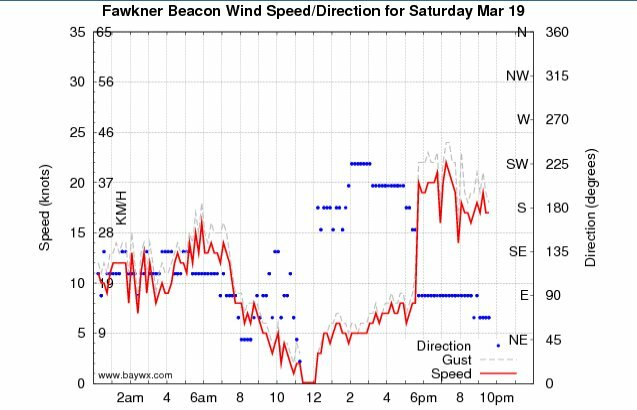 I did one backroll and made it 75% around, as the wind did not boost me much off the small wave. It was a nice day to focus on technique - flying the kite up and down to generate apparent wind and edging the board. The wind picked up occasionally so I did few small jumps to. The Noise 12m handled these conditions well. It is very predictable and turns well and generated plenty of power. The depower cleat below the bar can get a bit stuck, but once the cord is wet it easy to sort it out. It certainly wasn't crowded today. There was only 2 other kiters out, and for quite a while I was alone. I enjoyed the sesssion. You don't have to be always ripping in strong winds to have fun. There is an object hazard in the water close to the shore. Its timber and has a metal object attached to it. Presumably it drifted to shore and is now stuck there in the sand. It is marked by a small buoy. Watch out for it. A nice easterly sprang up at 6pm as forecast. Rather than driving to Altona, we decided to try Mentone. The wind has arrived by the time we got there. We had some nice kiting for about 30 minutes. The bay swell does not get big here in an easterly. Going out there are nice small waves which are great for launching a jump off or doing a backroll. Coming back in is very fast. I decided to try some backrolls. I made it around on the first one, but stopped moving with the kite flying in the opposite direction. I made it around on a second attempt. This is the first good backroll I think I have done. It is daunting committing to the move. I flung my head to the left and launched off a small wave. The landing was a bit flat, sort of on my bum. Its a great feeling completing one, and in my case a bit overdue. I did a third backroll as Stuart whizzed past, he was able to provide independent confirmation that I had succeeded. I did some toeside riding in the brisk wind. 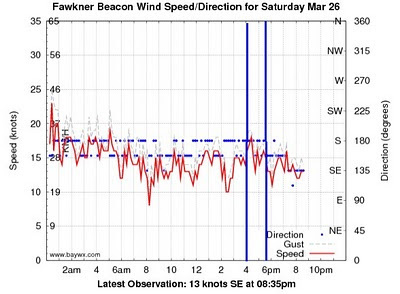 I had to depower the kite a bit too as the stronger gusts were a bit overpowering. I did some big jumps too; the biggest to date I think. I landed most well but swung like a pendulum under one and landed half on my vest. Then we decided to do a downwinder to Ricketts point. It was a bit weird getting going downwind and out of the "upwind tacking" groove. All the more reasons to do downwinders! I was able to practice carved turns to toeside, ride toeside, the fast carve back to heelside. Turning the kite quickly seems to help, as long as you turn it before you turn the board. I lost my board a couple of times when I got pulled off it while turning, but was able to body drag upwind to get it. Its a nice little tour. We arrived at South Ricketts (also known as Dalgety Road) to find several kiters and windsurfers all on fast tacks having a good time. The reef to the west looms large however. All in all, a great session. 9 out of 10. We were in the right place at the right time. We walked to a nearby friend's house after we packed our kites and loaded them in his car with our other gear. He then gave us a lift back to Stuart's car - a distance of about 2.5km. Predictwind was spot on again. A strong southerly whipped in at 3pm, breaking the spell of humid weather we have just had. At initially 30+ knots and some thunderstorms on the radar we waited a while before going out. Once out, it was good. 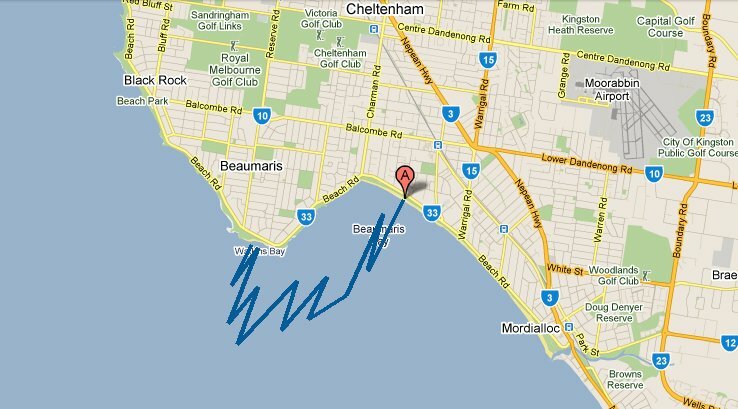 The reefs at Beaumaris can be tricky, care is needed to avoid an impact. However, the surf they generate is good fun. I did some "re-entry wave starts" going out - a fast turn on the face of the wave going out, then ride it back in toeside. There were only three kiters including myself and Stuart, but there were about six windsurfers out too. After 45 minutes the wind dropped a bit, so I made my way back upwind and returned to the beach. I had a lot of trouble landing my kite - I couldn't get the leading edge to drop on the sand in the gusty conditions on the shore. It whipped around behind a bush - very close to the cars - when one of the windsurfers grabbed it for me. The rain storms out west arrived about this time and the wind dropped too. Having someone to both launch and land your kite in these conditions is recommended. Beaumaris is definitely not a good place for beginners - the surf club looms large on the beach and the reef is unforgiving. However, it gets clear wind for the south and southwest. Stuart and I headed down to Cleeland Bight on Phillip Island to check it out for kitesurfing. We rigged up on the beach near Seaspray Avenue. However, there are some large pine trees there, and there is also some gnarly reef in the shallow water just off the beach. The wind dropped, so we really didn't get going. After dinner at Cowes, a strong easterly had arrived, so after bedding down the kids at Cape Woolami we headed back down to Cleeland Bight and found a better launch site with good beach access near Cottosloe Avenue. The sandy bottom was much nicer for launching too. We scored a great session. The wind was consistent and the flat water was nice. We kept fairly close to the launch site and didn't go near the channel that separates Phillip Island from the mainland at San Remo. A word of warning. Damien McKay, an experience local kitesurfer, died at this location in November 2005. 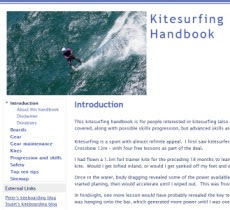 He was lofted on the beach after a kitesurfing session when returning to land his kite, and was unlucky to collide headfirst with some rocks on the beach. There were not many rocks about that I could see. Rest in peace Damien. This highlights the need to always consider safety. I still wear my helmet when kitesurfing.